Apparently, today is National Fondue Day. Who knew?! Baker Beth did. The Cookie O' The Month! I marvel at it's uniqueness, it's cheesy goodness, it's dusting of cinnamon, and it's lack of raisins. Thank you Baker Beth and cheese makers everywhere. I am forever in your debt. I also curse a little bit when I realize I can't tuck my shirt in. I was stumped. After baking up a storm in March, I was feeling a bit bereft of ideas for April. And then Angelo wrote about grilled cheese. A grilled-cheese cookie, Beth? Well, kind of. Not literally, of course. That'd just be weird. That'd be, well, grilled cheese. But the spirit of grilled cheese, dessertified? Heck yeah! Melty cheese and bread? That's fondue, baby! But plain ol' bread would be boring. Not enough interest, texturally. So ... croutons! 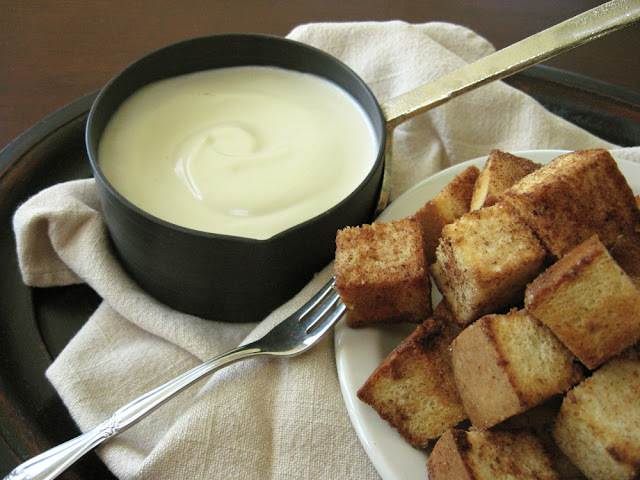 Cinnamon-sugar croutons, because Angelo likes cinnamon toast, he just doesn't like that it often involves raisins. And the cheese component had to be sweet and silky and smooth, to contrast with the crunchy croutons. For the purposes of this post, I used my wee Calphalon butter-warmer pan to serve the cheesy mixture, but I like the base of this little fondue set or maybe you already have one at home. P.S. You may want to sip some Champagne to cut through the richness of this dish. Just a thought. P.P.S. I made the bread that I then made into croutons. I like the texture it takes on when it toasts. But any sturdy loaf will do. Preheat oven to 350. Cut a sturdy loaf of bread into thick slices. Trim the crusts or don't. Dice the bread into hefty-yet-reasonable cubes, big enough to convey plenty of warm cheese, small enough to fit into your mouth. Put in a large bowl. Drizzle with melted butter. (How much butter you use depends on how much bread you have; figure about 3 tablespoons of melted butter for 3 cups of bread cubes.) Sprinkle with 1 tablespoon of sugar and 1 teaspoon of cinnamon. Gently toss to coat. Spread in a single layer on a rimmed baking sheet. Bake 15-20 minutes or until evenly golden, turning a few times with a spatula. Set cream cheese on counter to soften. When softened, beat in the bowl of a stand mixer until smooth. Beat in sugar, vanilla, and sour cream until smooth. Place bowl over a pan of simmering water (as for a double boiler), and whisk in a bit of milk (1/4 cup or less) until the mixture is warmed through and thinned to the desired consistency. Transfer to a heavy serving dish or fondue pot and serve immediately. Just so folks know, I am quite aware that there is no "cookie" in this Cookie O' The Month. But melty cheese trumps all! What?! Not a cookie, you say?! I'm sorry, I couldn't hear you over the cheese....I'll be right there, cheese. Yes, the siren song of cheese is impossible to resist.